Our daily updated search engine of photos with themes of Slovakia enlists more than 751 photos in portfolio of this author. We have detected that visitors who were interested in this large preview photography with title: Famous Orava Castle, Slovakia, were also further interested in other pictures from author Jareso. Here is a selection of 6 most popular photos available in portfolio of this author. Our daily updated search engine found that this royalty-free stock photo with theme of Slovakia entitled: Famous Orava Castle, Slovakia, is available at Dreamstime stock photo agency. We have detected that this stock photo is available in various resolutions, dimensions, licenses and file formats. The highest available dimension of this stock photo is as big as 2533 x 1900 pixels! If this stock photo was printed it would be as 21.4 x 16.1 centimeters (8.4 x 6.3 inches) big at size of 300 dpi. It is available in JPG file format as well as in additional TIFF file format. You can easily purchase and download this stock photo in the source agency. A view of famous Orava Castle in summer. 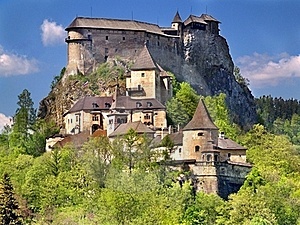 Orava Castle is considered to be one of the most interesting castles in Slovakia. This castle is situated on a high rock above the river Orava. It is located in Oravsky Podzamok town, Slovakia. Many attractions can be seen there including Museum, Night Tours, Festivals and much more. This castle is also a popular location for filming fairy tale, or horror movies. Many scenes of the world famous Nosferatu (1922) film were filmed there. It is definitely worth a visit. This stock photo was photographed by Jareso and it already had 16 downloads at the source agency. It means that 16 people already appreciated excellent quality of this royalty-free stock photo. Be another one to have it. Register at Dreamstime and purchase this photo today.